Every summer, Vegas has crazy thunder storms for like 4 days. And that time is now. It’s made me realize a couple things – 1) Damn nature, you scary, and 2) I could never live anywhere there’s actually weather. Sometimes people give me a hard time about roasting out in the Vegas heat, but if that’s all I have to worry about – no earthquakes, monsoons, hurricanes, sharknados – then I think I’m pretty well off! 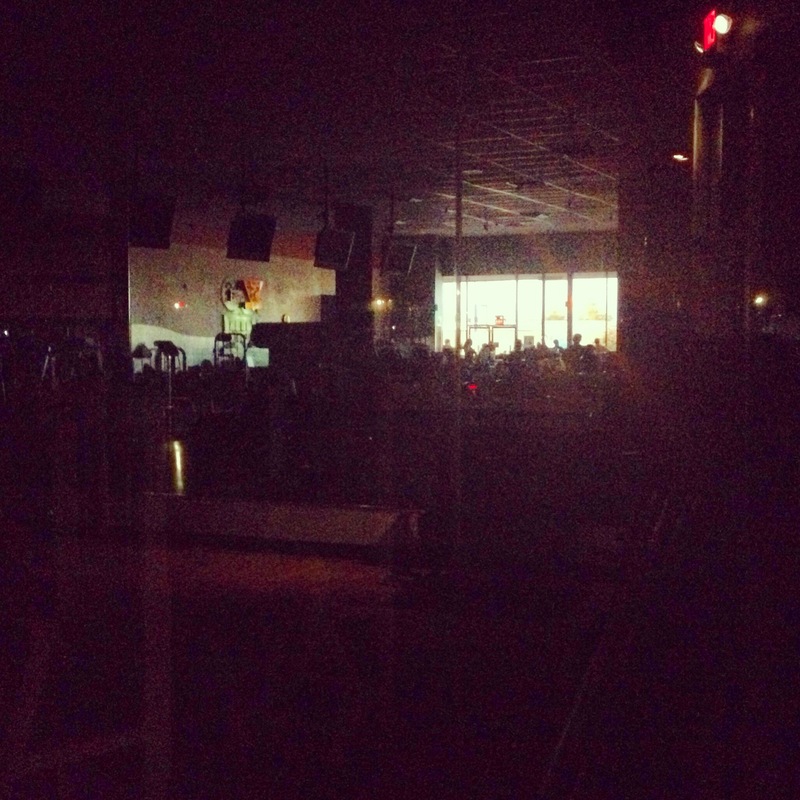 On Friday evening, I was getting in a quick workout at 24 Hour Fitness when it started storming and the power went out. It was super awkward to hear everyone still making workout noises when there was no air conditioning or music to down it out – workout noises are the worst. Why the f would people keep lifting weights when it’s pitch black in there? I was gonna make a break for it, when I noticed everyone crowding around the front window, looking at this palm tree that was struck by lightning and caught on fire. It was like the apocalypse trying to get out of that parking lot! Another highlight from the weekend was being out at dinner on Saturday night when the emergency flash flood alert went off on about 20 phones at once – needless to say it made for a super romantic ambiance! 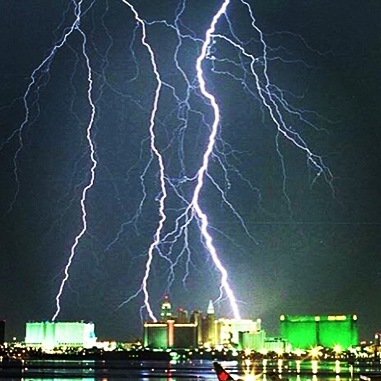 Thunder storms this weekend in Las Vegas. Pitch-black yoga is the new Bikram. 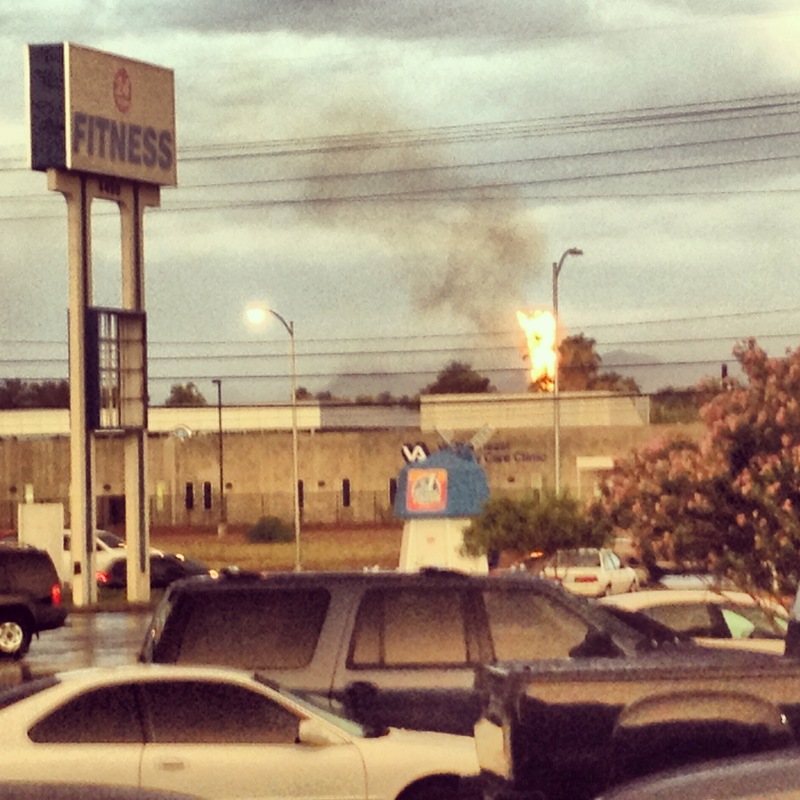 Never a dull moment at 24 Hour Fitness! This Tofu Mushroom Burger recipe is one of my long-time staples that I make on a regular basis, even since before I was fully vegan. They’ve been enjoyed by many carnivores who had no idea they were eating tofu (lolz!) I’ve even had this recipe be specially requested by friends who come to visit from out of town, yay me. Heat a large saucepan and saute the chopped onions for 3-5 minutes or until translucent. Mix in the mushrooms, garlic, cumin, red pepper flakes, salt & pepper and continue to cook on med- low heat for another 5-10 minutes, stirring occasionally. *Note* I prefer not to use oil to saute the veggies – the moisture is usually enough to keep things from sticking to the pan. You can always add some vegetable broth, water or white wine to deglaze the pan. This also gives you an excuse to open a bottle of wine…2 birds? While your veggies are cooking, drain your tofu and slice into 4 equal size “patties” (slice thinner for crispier tofu patties). Heat the olive oil in a separate pan and cook about 5 minutes on each side, or until golden brown. Season with salt & pepper. To prepare your guacamole, mash up the avocado, salsa, cumin, garlic, salt and pepper in a bowl. To assemble the burgers, take the bottom half of the bun, add one of the tofu patties and top with a heaping pile of the mushroom/onion mixture. Then take the top half of the bun and add a few tablespoons of the guacamole mixture. Add ketchup and mustard, if desired. Finally, find a way to mash the 2 halves of the bun together and stuff it in your face. *Note* it’s best not to make this for someone you have a crush on – it’s delicious but you will not look cute eating it. This looks good. 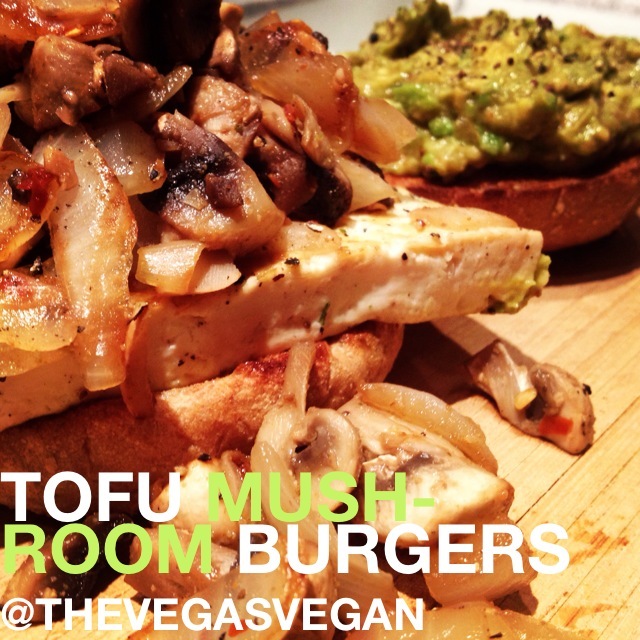 I have a recipe up for a simple mushroom burger, and like how yours includes tofu & other ingredients.